No matter what type of construction equipment you use, it’s important to know how to operate it properly. Not only can the correct operation keep you secure, but it can also keep others nearby safe. When you use scissor lifts in warehouses, construction sites, and manufacturing areas, you must take precautions. Adhering to scissor lift safety rules can help prevent you from falling, getting electrocuted, or having the machine collapse. 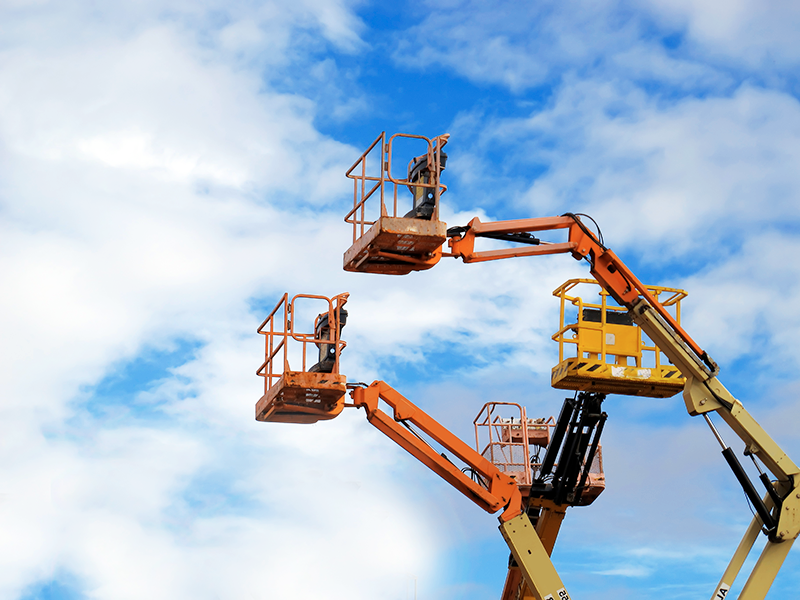 Find out how to use scissor lifts safely and why training is vital. 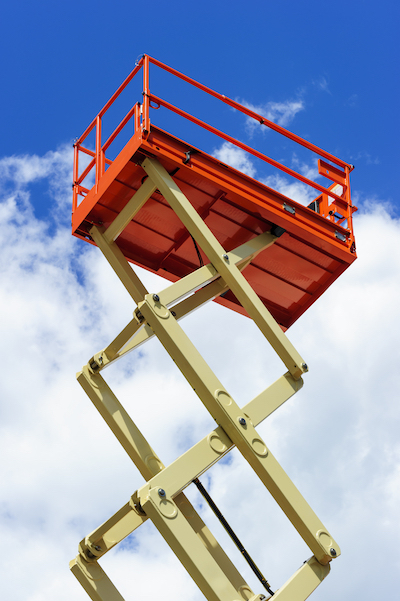 You can use scissor lifts in place of boom lifts if your project only requires a vertical lift under 50 feet. These lifts have beams resembling scissors that raise and close, resulting in the machines’ name. The beams move hydraulically, mechanically, or pneumatically. The machines have large platforms, so you can bring all your tools up with you. They’re different from aerial lifts because scissor lifts move the entire platform up and down. They also let you reach a wider area of a ceiling or wall, so you don’t have to reposition the machine. You must have the proper training to operate these machines. Before you use a scissor lift, check the vehicle. Look at its fluid levels, guardrails, tires, brakes, and battery. You should also examine the platform and basket controls. You don’t want to stand up on the lift and have it fail to retract. After you inspect the machine, check the worksite. Walk around the area, and check the ground. This step lets you check for speed bumps, potholes, holes, and other obstacles. The ground must remain stable and completely level or the scissor lift won’t operate. Keep the lift away from people and other equipment. You don’t want someone to accidentally hit the lift while you’re on the platform or stand nearby when you raise and lower the lift. It’s also best if workers avoid walking around the area in case you drop something. Since you will be working high off the ground, think about investing in fall protection equipment (FPE). As long as you have a functioning guardrail system, you are not required to use FPE. The guardrails give you added security if you work at a height of 6 feet or higher. However, if you raise the platform, never climb over the guardrails. FPE items include body harnesses or restraining belts. The FPE can also protect you if you work over dangerous materials and objects. The belts attach to your body via a lanyard to prevent you from falling off the platform. Never attach the belts to a nearby pole or structure. You should also make sure that the access gates remain closed when standing on the platform. Situate yourself firmly on the platform’s floor or bucket. Avoid using planks or ladders while atop the lift. Electrocution is one of the top causes of fatalities while using scissor lifts. Since you’re working above the worksite, it’s vital to pay attention to power lines and other aerial equipment. You must also remember that electricity can jump from power lines, even without direct contract. It’s best to stay at least 10 feet away from overhead power lines because you never know if they are live or not. Try to keep any item that conducts heat, such as pipes and other wires, at least 10 feet away from these lines. In addition, you should wear safety gear, such as hard hats, insulated gloves, and rubber boots. These items give you extra protection if you work near electricity. If you operate the scissor lift outside, keep an eye on the weather forecast. Avoid using the lift when strong winds occur since that increases your risk of losing your balance or toppling the machine. Falls are another one of the top causes of death in the construction industry. It’s best to not use the scissor lifts if winds reach about 20 miles per hour. Winds that reach that speed tend to sway small trees. Make sure to pay attention to weight limits. There’s a reason that the manufacturer lists the maximum weight allowed. This total includes all workers and tools that sit atop the platform. Surpassing the weight limits can cause stress to the machine and cause instability issues. Make sure you have the proper safety training before operating scissor lifts. However, keep in mind that the higher the lift, the more cautious you should be. For more information about scissor lift safety and how to rent one, reach out to the experts at BigRentz.